Teen users could get text messages like, "Is it hard to not JUUL in places you're not supposed to, like school? 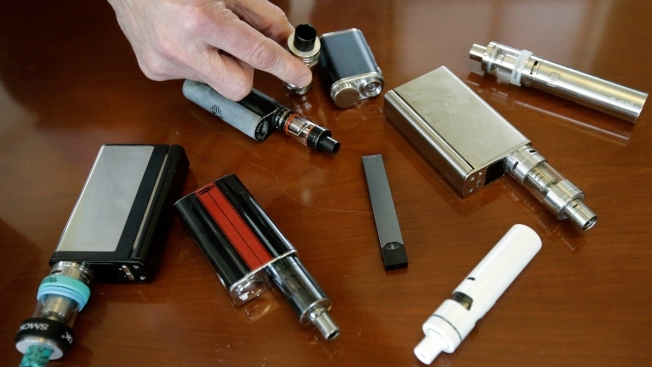 Reply YES or NO"
In this Tuesday, April 10, 2018, file photo, a high school principal displays vaping devices that were confiscated from students in such places as restrooms or hallways at the school in Massachusetts. Struggling to grapple with the epidemic, the Food and Drug Administration is holding a public hearing Friday to solicit ideas on the best interventions to curb youth e-cigarette use, NBC News reports. Among the presenters at the forum in Silver Spring, Maryland, will be Truth Initiative, a nonprofit best known for its envelope-pushing anti-smoking ads aimed at teens and young people. The group has now created a first-of-its kind text messaging program designed to help young people quit vaping. "We started seeing more and more that people were posting that their New Year's resolution was to leave JUUL and to quit e-cigarettes, but they weren't finding any help," said Megan Jacobs, who works on Truth's innovations team and led the project. "So we said, 'Hey, we've got programs. We could adapt those programs to help people quit e-cigarettes as well as we could help them quit smoking.'"